Have you been receiving mailings of all the summer camps in your area? So have we! We've created a list of summer camps you can refer to from year to year, so bookmark this page to get a jump on your summer camp reservations. We found summer camps offered part time and full time, mornings and afternoons. We've noted here whether it is a morning summer camp or all-day camp. We've also noted which months the camps are offered, so you can scan through our list of summer camps for the time that fits for your schedule. While this is not an exhaustive list of summer camps and does not include Vacation Bible School (VBS) offered by local churches, you will find some summer camps offered by local churches here. Whether you want to find a sports, culinary, or STEM summer camp, you'll find them all in Collin County! 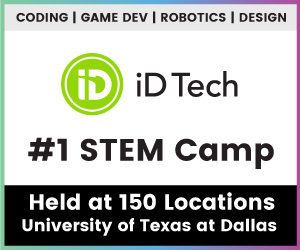 iD Tech is the leader in summer STEM education, with 400,000 alumni since 1999, and 150 prestigious campus locations. Students ages 7-19 learn to code, design video games and Fortnite-inspired levels, mod Minecraft, create with Roblox, engineer robots, and more! Weeklong, day and overnight programs. 5-10 students per instructor (max 10). Grades 1-6, offered in June. Is your child more likely to fix the toaster in your house than you? Well, this may be just the camp for him/her! Offered June-July for children 6-12 years, 9am-4pm, M-F. A week-long, mixed-age academic summer camp based on the premise that students must pursue their passions until they become their talents! We embrace the freedom of choice, allowing campers in incoming 1st through 8th grade to choose 4 courses from a catalog of interdisciplinary, high-interest STEAM courses that most align with their passions and curiosities. Ages 5-13, camps from culinary classes to sports. Full and part time camps. Locations available throughout Collin County. Ages 5-11, June-August, all day and extended day camps available. Fun topics include amusement park science, space camp, robots and inventors. Offered June-August for children ages 8-15, 8:30-1:00; weekly or daily. Under the guidance of their amazing camp counselors, the FUNcampers will experience activities full of learning and collaboration with new friends! Full-day camps for kids 6-18 interested in coding, robotics, drones, and design. 9:00-4:00; weekly. Ages 5-12, choose one to ten weeks. A unique blend of various weekly themes. Grades K-4th, offered June-July, 9:00-4:00. A Christian Day Camp experience with fun-filled days building children's character. Ages 8-18, one week camps, 9am-4pm. All levels of players welcome to Hoop Camp. Development Camp for advanced players age 12-18; Dance camp for all skill levels ages 6-18. Locations available dependent upon time and class and include Allen, Frisco and Plano. Locations available in Frisco, McKinney and Plano. Ages first grade+, June-August, half day or 9am-3pm camps. Early drop off, Late pick up available. Learn to play and possibly perform on stage! Locations include Fairview, Frisco, and Plano. Ages 3 and up, camps offered in June and July, mornings, with some classes until 2pm. For the child who just can't stop jammin' to the music! For kids age 36 months thru grade 7, camps are 9:00am - 2:00pm. Offered June-July. Snow play to science and everything in between. Teen Business Bootcamp for teens entering the 7th-12th grades in Fall. Offered June 17-21. Participants will learn how to develop and launch their business idea. Ages 6-18, June-August, 8:30am - 4:30pm. Ideal opportunity for the child who loves to be the center of attention! Ages 5-17, offered June-August, half and full days.